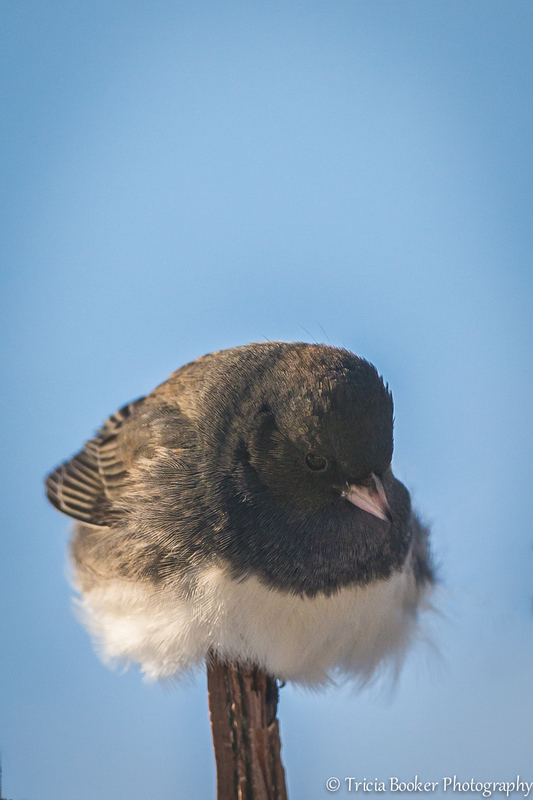 Today I revisited some of my bird photos from last winter to check the lenses and settings I’d used, and I came upon this Dark Eyed Junco that I hadn’t edited. I spent some time playing with it, taking out some background clutter with Macphun Snapheal Pro and using Intensify Pro to produce a bit more contrast in the shadowed face. The lighting wasn’t ideal for this shot, but since birds are generally hard to pose, sometimes you have to work with what they give you! With the temperature dropping to 0 degrees F. tonight, I’m planning to top off the feeders in the morning. I haven’t had my camera out in a couple of weeks, so I plan to spend some time with the birds tomorrow. Since they’ve been well fed with three different types of bird seed and suet, I figure a little modeling is the least they can do in return. This is so awesome ! From his pose to his fuzzy belly. Awesome Tricia! Thanks so much, Emily! I love these little guys! Poor little fellow, winter is so hard on the wild life. I like to think that my bird feeders offer them a nice winter break! Oh that is just too cute!! I do love the little Juncos! They always seem so perky even when they’re cold! I just love their name too! !